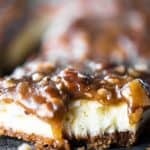 This Pecan Pie Cheesecake Dessert recipe is TO-DIE-FOR with luscious cheesecake on a graham cracker and pecan crust topped with a gooey pecan pie sauce. 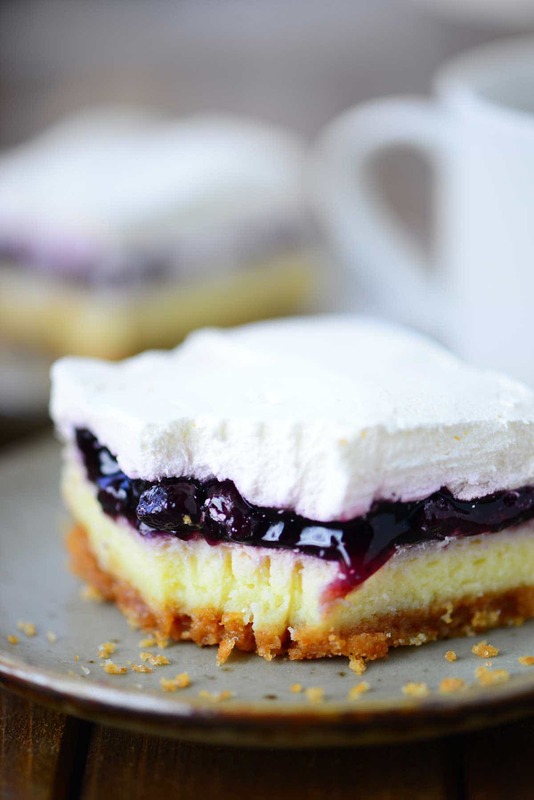 I’ve shared multiple cheesecake dessert recipes from the original blueberry cheesecake dessert to the most recent caramel apple cheesecake dessert recipe. 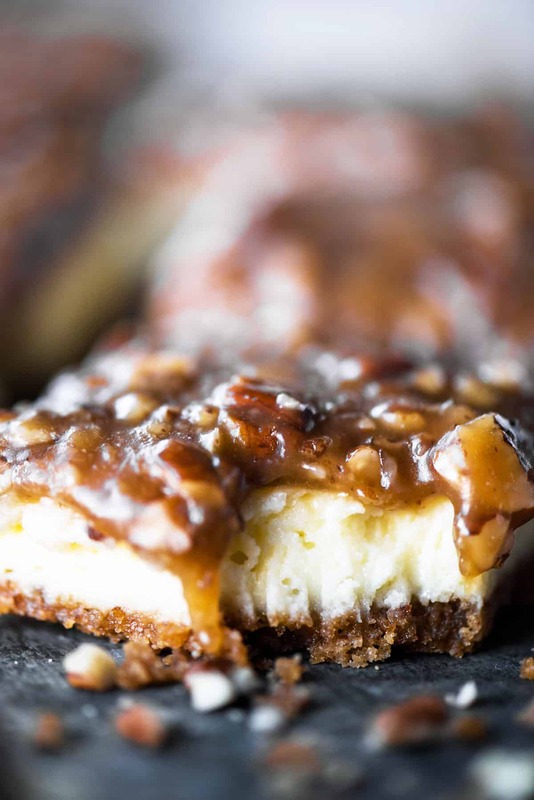 Every one of them is fabulous but this Pecan Pie Cheesecake Dessert just might be my favorite of all time! Disclaimer: Please note that some of the links below are affiliate links and I receive small commissions for purchases made through those links at no additional cost to you. Thank you for your support! First, crush 9 graham cracker sheets. These are the full sheets of four small graham crackers that you find when you open the sleeve of graham crackers. 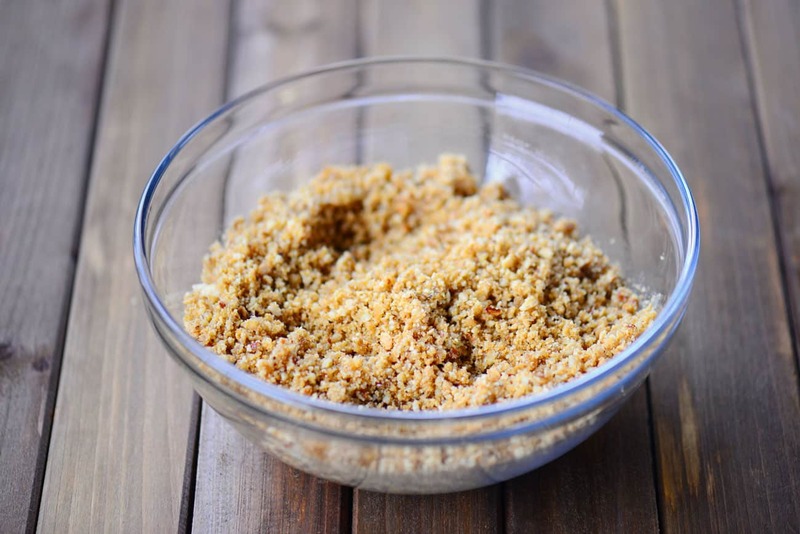 You should have about one cup of graham cracker crumbs. You can crush the graham crackers in a food processor if you have one. Or put the graham crackers in a gallon size ziptop bag and use a rolling pin to crush them. Next, mix together the crushed graham crackers, chopped pecans, brown sugar, and melted butter. Press the mixture into a 9×13 pan. The easiest way to flatten the crust is to use a small measuring cup or drinking cup with a flat bottom. Otherwise, try sliding your hand into a plastic sandwich baggie and use your covered fingers and hand to flatten the crust. First, beat two 8-oz packages of softened cream cheese until smooth and fluffy. If you need to soften your cream cheese in a hurry, place the foil-wrapped blocks of cream cheese in hot water for several minutes until softened but not melted. Next, beat four eggs and then add them to the cream cheese. Also, add one cup of granulated sugar and the vanilla extract. Beat until smooth, scraping the bowl occasionally. Finally, pour the cheesecake filling over the graham cracker crust. Bake at 375 for 22-25 minutes or until the top is dry to the touch. Cool the cheesecake completely before making the pecan pie sauce. 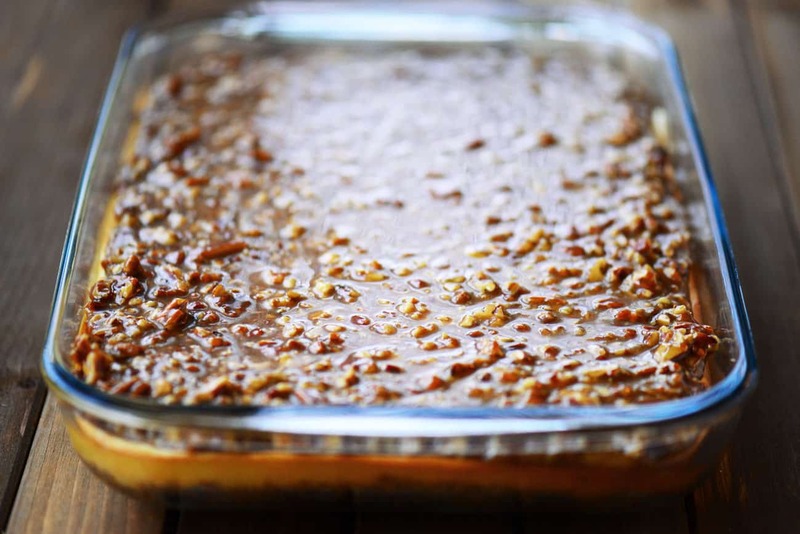 And now for the grand finale…the pecan pie sauce for the top of the cheesecake! I’m warning you that it’s going to be hard to resist eating the sauce with a spoon instead of putting on the cheesecake. In a large pot, mix together brown sugar and flour. Stir in heavy cream, butter, and corn syrup. Bring the mixture to a boil over medium heat, stirring often. Once it starts to boil, turn the heat down to low and cook for 8 minutes, stirring constantly. Remove from the heat and stir in chopped pecans and vanilla. Allow the mixture to cool for a few minutes and then pour the mixture over the cooled cheesecake and spread it out evenly. Place in the fridge to allow the pecan pie sauce to cool and thicken. Store in the fridge. I’ve already made this Pecan Pie Cheesecake Dessert several times and everyone, from the old to the young, loves it! Kids are initially fooled by the look of a brown dessert with nuts on it but all it takes it one bite to win them over. My husband brought a pan of it to work to share and returned with a completely empty pan…not even a crumb leftover! Crush the graham cracker. 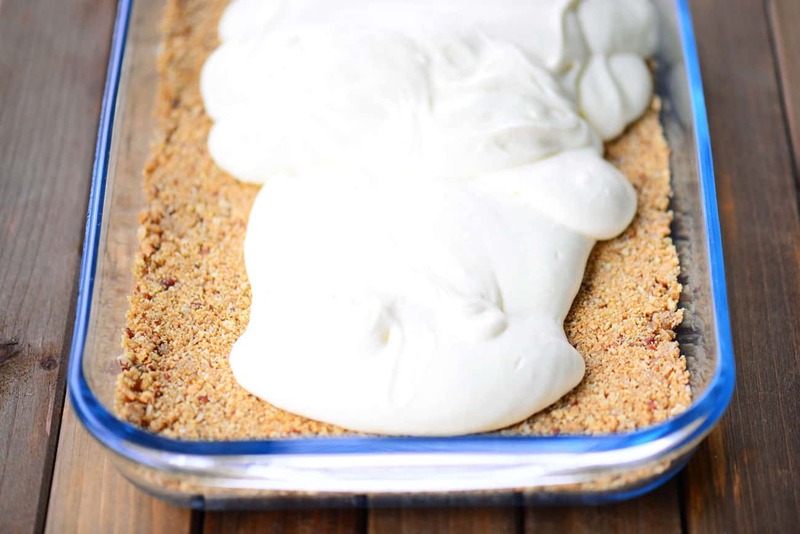 Mix together the crushed graham crackers, chopped pecans, brown sugar, and melted butter. Press the mixture into a 9×13 pan. Beat two 8-oz packages of softened cream cheese until smooth and fluffy. 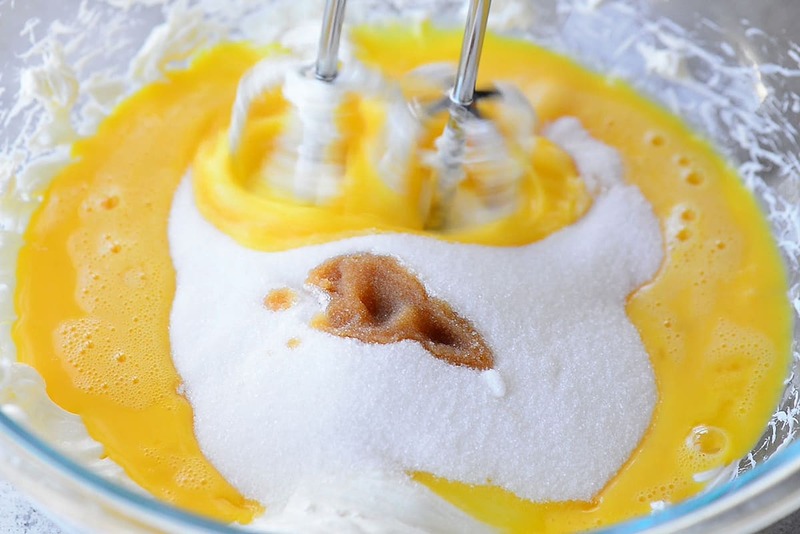 Add the beaten eggs, one cup of granulated sugar and the vanilla extract. Beat until smooth, scraping the bowl occasionally. Pour the cheesecake filling over the graham cracker crust. Bake at 375°F for 22-25 minutes or until the top is dry to the touch. Cool the cheesecake completely before making the pecan pie sauce. Should salted butter or unsalted butter be used? Can this all – including topping – be made the day before and stored in fridge? Thanks. Yes, you can make it the day before. That’s what I did when I sent a pan to work with my husband. Happy Thanksgiving! 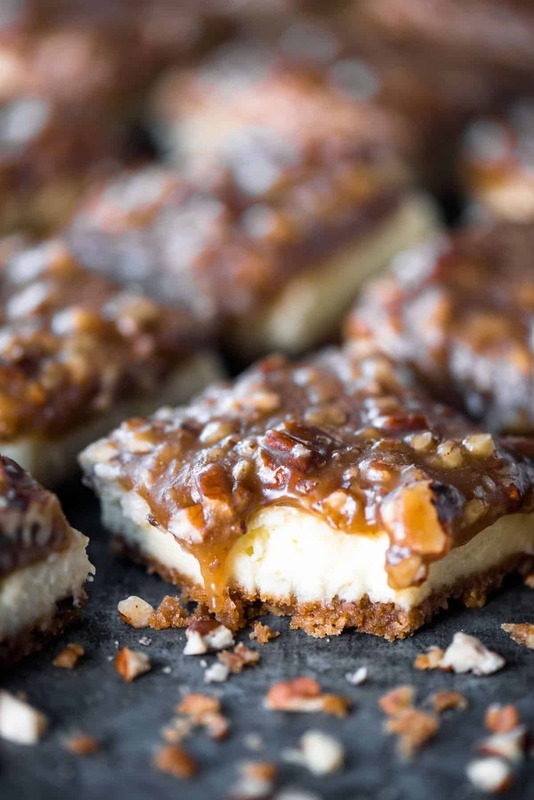 Never really thought of combining pecan pie with cheesecake, but this recipe looks absolutely amazing. Thanks for sharing! I’ve never tried it. The cheesecake is pretty soft so I’m not sure how well it would work. If you do give it a try, stop back and let us know how it went. Like the topping recipe could have easily been cut in half and it would have been more than enough to cover the cake. It was good just way too sweet. I made this yesterday, it was very good but the topping didn’t turn out quite right. Instead of looking like it does in your pictures where it’s more syrup, mine turned out similar to a fudge…and it seems like the sugar crystallized…. What could have gone wrong? I cooked it exactly like the instructions said! Made this and cooked for recommended time and temperature, took out when top was dry. After letting it cool I touched the top and it came off on my hand and was very wet. The filling is foamy and not cheesecake consistency…what went wrong? This looks so dangerously awesome! I will have to try this. I am sure my kids would love it (too much)! I followed you from Linked IN and thought your blog sounded great! I’m gonna keep poking around. Thanks for sharing this awesome recipe! Sounds delish. I would like to make this for Christmas. 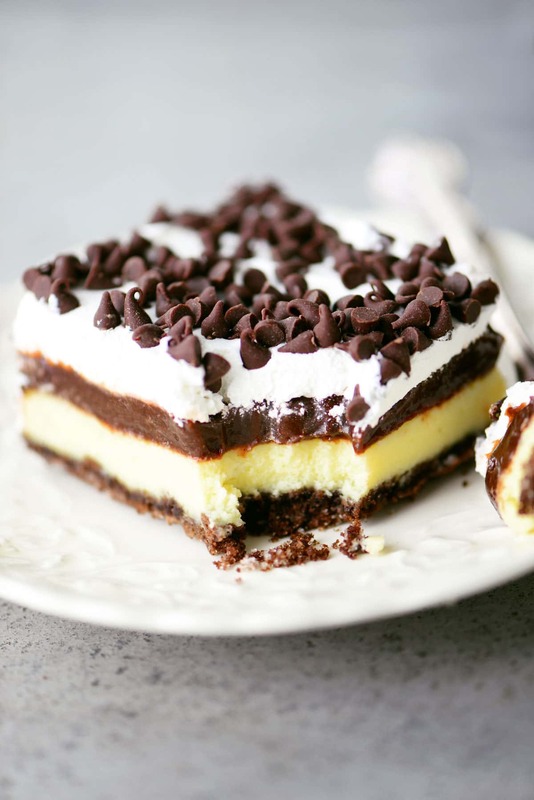 This may be a dumb question, but I am just wondering after you boil the topping and pour it, wouldn’t that boiling mixture melt your cheesecake? I allowed the mixture to cool slightly but it thickens as it cools so don’t wait too long before pouring it or you won’t be able to spread it out.